Studies show email remains one of the most powerful and cost-effective tools in the digital marketers’ arsenal – especially when it comes to permission-based promotional messages and personal communications. Here are our key recommendations to maximize the impact of your email campaigns, increase open rates and boost customer engagement. With so many consumers using social media these days, it’s tempting to assume the humble email has lost its marketing impact. Not so, according to the data. Research shows that email marketing consistently generates the highest ROI for marketers and remains a core tactic for delivering revenue back to the business. Marketing trends come and go, but email’s still here. Personal, transactional and timely, email marketing campaigns consistently outperform other digital channels when it comes to generating higher-than-average open and click-through rates. Why? Compared to social media, email has by far the biggest reach – there are three times more email accounts than there are Facebook and Twitter accounts combined. Quite simply, anyone who is online will have an active email address. 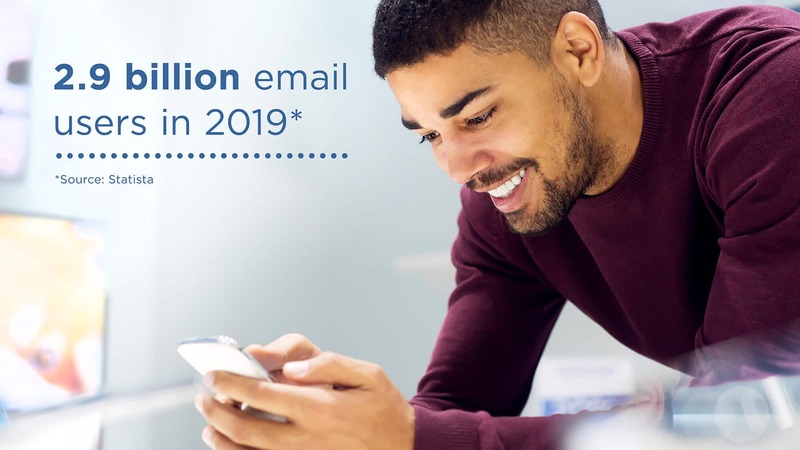 Indeed, market research firm Statista forecasts the number of email users worldwide will hit 2.9 billion by 2019. If today’s ‘channel battle’ winner wasn’t clear enough, Statista data from 2016 showed the average open rate for emails with a personalized message was 18.8%. Even those without personalization managed a 13.1% open rate. Here at Mapp, our customers have seen email open rates top 55% for some creatively designed personalized campaigns. Compare all this to a 0.90% average click-through rate across all industries for Facebook ads! With email already claiming the marketing crown, the question is: how can we make it perform even better? Here are our top tips to boosting open rates and generating even higher levels of customer engagement. 1. Grab attention…and be clear what to do next It stands to reason that attention-grabbing headlines, great content and appealing images will draw readers in. Catchy headlines and images can spark initial curiosity and interest. Whether you’re sending out short and simple emails that rise above the noise, or are announcing important news or an outstanding offer, the design and layout of your email is pivotal to keeping readers interested – and getting them to naturally move toward your call-to-action (CTA). Using a single column layout is a proven way of getting readers to perform a specific action. However, multicolumn layouts often suit emails with a lot of content to share – such as newsletters or product emails that discuss a lot of features. And while Facebook may not inspire too many direct open rates, adding a button to allow your email to be socially shared is always a good idea. Whether the ‘share’ is via email or across a favored social network, this has been shown to contribute to wider distribution and to boost click-throughs (as the shared email comes not from the brand, but from a known and trusted colleague or friend). One final point here: when it comes to calls-to-action (CTA), offering more choices often creates fewer conversions. Go easy on the number of choices you’re offering and make it simple for readers to know what to do. And always place your key offer or CTA where it’s easy to see and act on. 2. Build integrated omnichannel campaigns that increase engagement Designing campaigns around key customer lifecycle moments is crucial to building lasting loyalty and ongoing engagement opportunities. For example, your initial ‘Welcome’ campaign for new customers will set the tone for what you hope will become a lasting relationship – generating the all-important marketing permissions you need to continue to engage with your audience. Integrated omnichannel campaigns are a proven way to increase engagement. So, from the moment a new customer signs up to a subscription, or makes that very first purchase, you can send out email messages that build over a 10- or 12-day period, using personalized mobile push messages to increase engagement at every stage. 3. Make it personal One of the most effective ways of establishing highly individualized communications with customers is to focus on the special events in their lives. For instance, sending birthday offers based on previous purchases a customer has made, searched for, or added to their wish list. Timing is everything here – some offers will be perfect for a quick grab and can be sent on the day itself or a few days before. Others, however, will require a longer lead time so the customer can plan ahead and avoid disappointment (and thereby, dissatisfaction with your brand). Customer anniversary campaigns are another valuable opportunity to build positive customer sentiment. Sending a ‘you’ve been with us for three years, and we’d like to say thank you’ reward email is a great way to demonstrate appreciation of a customer’s continued loyalty. Similarly, why not consider initiating a visually informative campaign that captures in-app usage or spend data in a weekly email donut chart summary – to keep subscribers informed and updated on information that’s relevant to them? 4. Make it relevant Create loyalty and generate stronger relationships with email campaigns that ensure highly targeted content is sent to each customer. For example, if you know a customer has booked a vacation – or will soon need to renew their car insurance – in the weeks before the critical date a series of triggered messages can be sent on predetermined days, containing suggestions on options, opportunities to pre-book other services, ideas on linked activities or checklists that will make life easier. Using sophisticated targeting and personalization delivers higher open and click-through rates – all of which increases conversion opportunities. 5. Segment your audience You may have new purchasers, regular purchasers or lapsed purchasers and each will need to be treated individually. By carefully targeting your offers to different segments of your list, you can reduce unsubscribe rates and increase response rates. Segmentation is driven by data, so evaluate every source of data capture – website store, web analytics, CRM systems, competitions and surveys – to build up a picture of the customer and their interests. You may want to target your campaigns using profile-based segmentation (age, gender, geographic location), forthcoming events (calendar-based) like a recent action or subscription renewal, or use behavioral-based segmentation to track when the purchasing frequency of loyal customers drops away. Dividing your database into smaller chunks of people who share a certain characteristic, and treating them as a separate audience for targeted email shots, will make it easier to form better relationships and increase campaign response rates. 6. Integrate email with your website For e-commerce brands, the ‘integration’ point is perhaps the most important. How many times have you added a product to your online basket, only to be distracted and leave the site, or decide not to purchase that exact moment and maybe come back later? According to 2017 research by Baynard Institute, it happens a lot. In the three months prior to its survey, 58.6% of US online shoppers abandoned a basket because “I was just browsing / not ready to buy”. Most, it seems, abandon before they start the checkout process. There’s a lot more interesting data around abandon rates in the report. Take a look here. By integrating web and email, brands not only have an opportunity to reduce abandon rates, but can engage with customers in real time with transactional emails. E-commerce brand Otto.nl, ranked in the top 5 online shopping destinations in the Netherlands, did exactly this: contacting shoppers who abandon their cart to encourage them to complete their order. See the results in the Otto email marketing case study here. As we’ve seen, email can be tremendously successful, and is without doubt one of the most valuable channels in your digital marketing kitbag. The key, of course, is to use all the tools available – from applying responsive design through personalization to automation, segmentation and more. Happily, it’s not as complex, time-consuming or expensive as you might think. In fact, it’s often quite the reverse. So remember, when planning your campaign, there’s more to email marketing than pressing ‘send’.